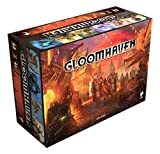 There are two ways to play Gloomhaven: campaign mode and casual mode. In campaign mode, players will form an official party of characters and undertake a number of consecutive scenarios over multiple play sessions. This allows players to follow a story thread as they make decisions and explore a path of their own choosing. A scenario can only be played in campaign mode if all the prerequisite global and party achievements listed as required in the Scenario Book are active for the party. In addition, once a scenario has been completed in campaign mode, it cannot be undertaken again in campaign mode by any party. In casual mode, players can play any revealed scenario on the world map regardless of achievements or whether it has been completed in campaign mode. Players can still gain experience and money, loot treasure tiles, complete battle goals, and make progress toward completing their personal quests, but any story text or rewards listed at the end of the scenario are disregarded. A party in campaign mode can switch to casual mode to go through a scenario they have already completed, but it is strongly recommended that a party not undertake a scenario in casual mode that they haven't yet experienced in campaign mode. The rules that follow will deal specifically with playing the game in campaign mode. The campaign board is used to track the global progress of the game world. The locations, achievements, and prosperity tracked on the board apply globally to all parties playing in the world. A map of Gloomhaven a and the surrounding area b. Numbered circles on the map c represent scenarios that can be unlocked through the course of playing the campaign. When a scenario is unlocked, its corresponding sticker d is placed over the numbered circle. 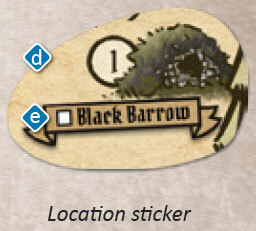 When an unlocked scenario is completed in campaign mode, the blank spot on its sticker e is marked to signify this. A reference grid for the map f so that scenario locations can more easily be found. A space for tracking global achievements g. When a global achievement is unlocked, its corresponding sticker h should be placed in one of the sticker slots in this space. A prosperity track i. When the prosperity of Gloomhaven increases, a square on the prosperity track should be marked for every point of increase, moving from left to right. At certain thresholds, this will increase the prosperity level of Gloomhaven. A party is formed when a new group of players gets together to play the game. They will document the formation of the party by starting a new entry in the party sheet notepad. Party achievements, reputation, and location will be tracked on this notepad. A party can persist from scenario to scenario and play session to play session, as long as the players want. The makeup of the party will change over time, especially as characters retire and new characters are created. Changes to the party makeup are fine, not only for characters, but players as well. New parties can also be formed at any time, though new characters should be made for a new party. A space to name the party a. Every good party should have a name. Be creative. A space to track the current scenario location of the party b. This is mainly relevant for linked scenarios. A space for notes c. If there is anything else a party would like to track, they can do so here. A space to track party achievements d. Whenever a party earns a party achievement, it should be noted here. A reputation track e. A party will gain and lose reputation over time for a number of reasons, and this is tracked by penciling in or erasing sections of the reputation track on the notepad. To the right of the track, the item price discounts and penalties for high and low reputation f are visible. To the right of the track, the item price discounts and penalties for high and low reputation are visible. 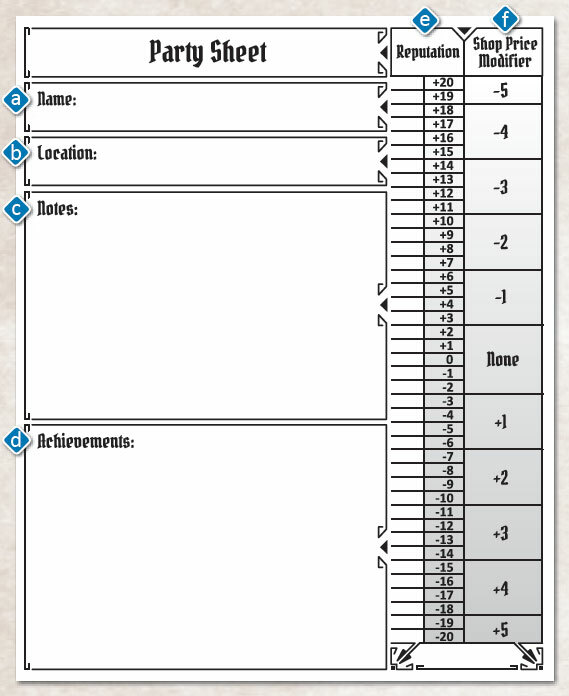 When a new character is created, the player should start a new entry in the character's corresponding character sheet notepad. 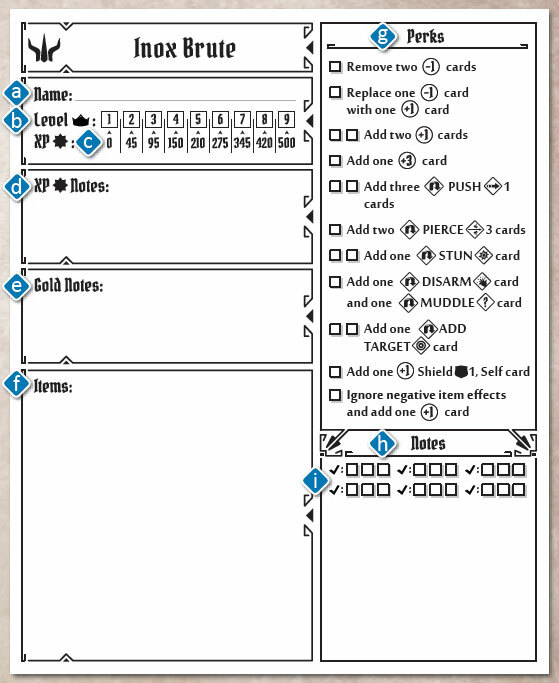 As players play through a campaign, they will need to keep notes on what experience, gold, items, perks, and available ability cards they have in their deck by using this character sheet. A space to name the character a. Every character should have a name. Be creative. A space to mark the current level of the character b. As characters gain experience, they will increase in level. The total amount of experience needed is written below each level c.
Spaces to keep detailed notes on the amount of experience d and gold e a character has. A space to track all the items a character has in their possession f.
A perk list specific to the character class g. Whenever a character gains a perk, they mark the one on the list they want. A space for additional notes h. If players would like to track progress on other aspects of their character, they can do so here. This space also includes a track for checkmarks i attained through battle goals. When a character is created, he or she is dealt two random personal quest cards and chooses one to keep, returning the other to the personal quest deck. A character's personal quest is their primary reason for participating in a party. A thematic description of the quest a. The specific requirements for completing the quest and the rewards for doing so b. When a personal quest is completed, the character will retire. Whenever a "Random Item Design" is listed as the reward when looting a treasure tile, the looting player should draw a card from the random item design deck. These cards look very similar to normal item cards, but have a blue back, shown at the right. When a card is drawn, the player should find the one additional copy of the drawn item with the same reference number in the deck of unavailable items and add both cards to the city's available supply of items. It is possible to deplete the random item design deck. In this case, additional random item design rewards have no effect. Whenever a "Random Side Scenario" is listed as the reward when looting a treasure tile, the looting players should draw a card from the random side scenario deck. 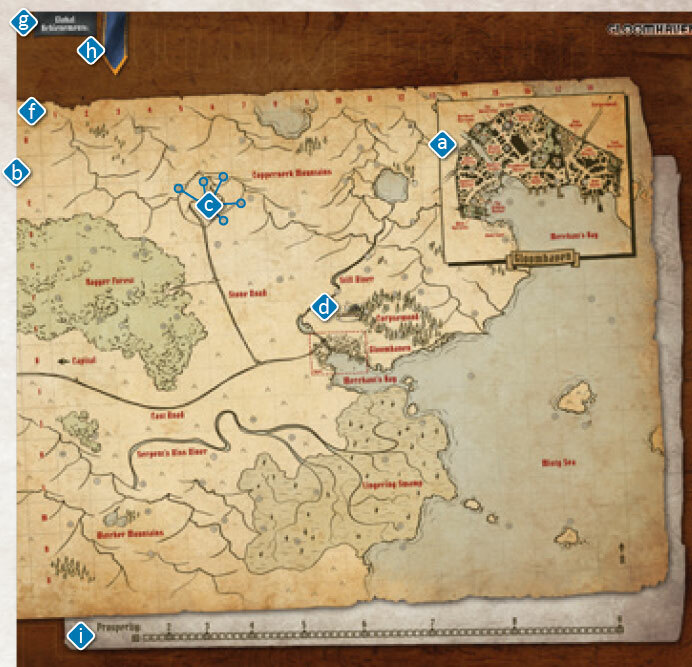 The drawn scenario is then immediately unlocked and its corresponding sticker is placed on the campaign map. The drawn scenario card is then removed from the game. It is possible to deplete the random side scenario deck. In this case, additional random side scenario rewards have no effect. Players will have many opportunities to encounter city and road events throughout a campaign. When players encounter an event, they draw the top card off the corresponding deck and read the front side a. 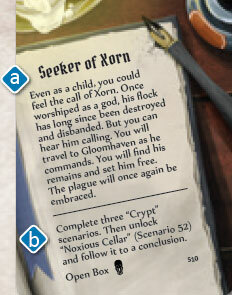 Note that event cards have content on both sides, and the back b should not be read until the front is resolved. City events and road events have different art and content, but they work the same way. A thematic introduction to the event c. This should be read first. A decision point d. The party as a whole must choose between two options depending on their preference. Only after a collective decision has been reached should the card be flipped over and the proper outcome on the back resolved. 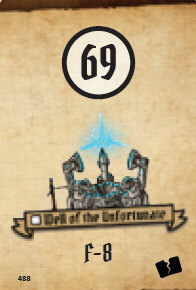 The number of the event e. This number will be referenced in the game when instructing players to add specific events to their respective decks. Descriptions of both choices f. Depending on which option the party chose, players should read the corresponding choice and ignore the other. The outcome of a choice g, which consists of a block of thematic text followed by the specific game play effects on the game in bold. A choice can contain multiple separate outcomes, some dependent on specific conditions. Icons directing players to either remove the event card from the game h or return it to the bottom of the corresponding event deck i after the outcome is resolved. 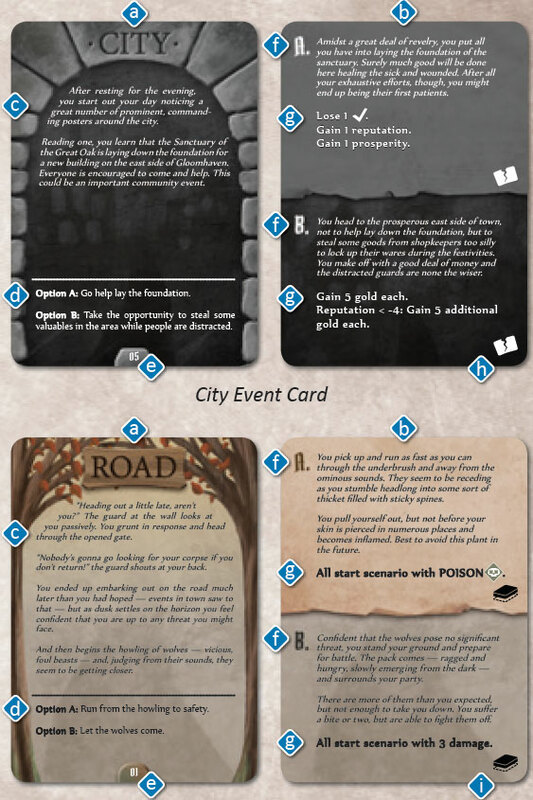 When the game box is opened and the campaign begins, a shuffled city event deck and road event deck should both be created using city and road events 01 through 30. 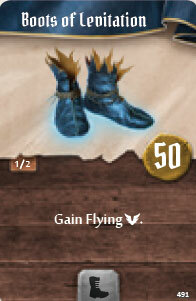 Players will be directed to add or remove certain events from these decks over the course of the campaign. When a card is added to an event deck, the event deck should then be shuffled. Note that adding a card is different from returning a played card to an event deck, in which case it is placed on the bottom of the deck and the deck is not shuffled. The game box includes a number of sealed boxes and envelopes, each designated with a symbol or letter. At certain times, the game will direct players to open one of these. If it contains materials for a new character class, that character class is now available for anyone starting a new character. If the envelope contains other contents, the contents will direct the players how to use them. Players will be directed to open boxes or envelopes when they complete personal quests or meet specific conditions. The game box also includes a small sealed book titled "Town Records". Players are directed to open this book once the first character retires, at which point they can begin reading the book from front to back. At certain points in the book, players will be directed to stop reading until certain conditions are met. The achievement system is the main way that players will keep track of major changes in the world and what scenarios a particular party has access to while playing in campaign mode. There are two types of achievements: global achievements and party achievements. Global achievements affect the entire game world, regardless of what party is playing in it. Global achievements are tracked with stickers along the top of the world map a. Some global achievements have a specific type (listed after the achievement in the format of "Type: Achievement", e.g., "City Rule: Militaristic"). Only one global achievement of each type can be active at a time. If a global achievement is gained and there is already an active achievement of the same type, the previous achievement is overwritten and the new sticker is placed on top of the previous one. Multiple instances of a single global achievement are possible, so long they don't have a specific type. Party achievements are tied to a specific party and are mainly used to keep track of what scenarios are available to play in campaign mode for that party.